As of June 2012, the target landing area for NASA's Mars Science Laboratory mission is the ellipse marked on this image of Gale Crater. The ellipse is about 12 miles long and 4 miles wide (20 kilometers by 7 kilometers). Landing will be about 10:31 p.m. on Aug. 5, 2012, Pacific Daylight (early Aug. 6 Universal Time and Eastern Time). If landing goes well, the mission's rover, Curiosity, will drive in subsequent months to science destinations on Mount Sharp, outside of the landing ellipse. 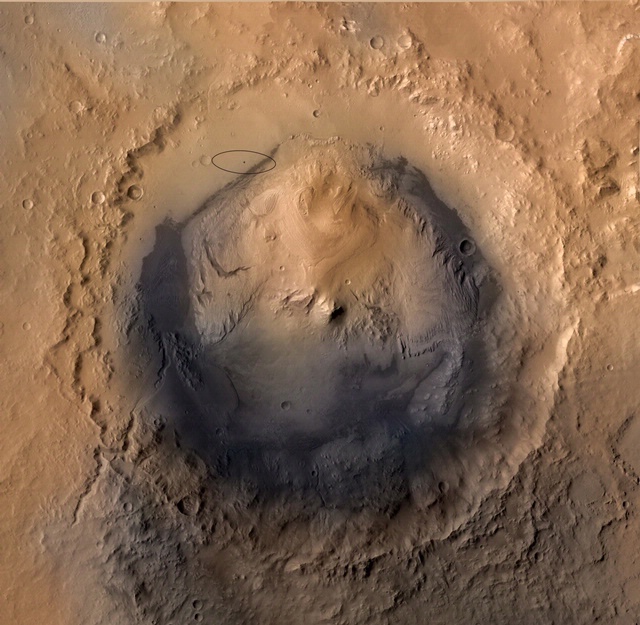 This view of Gale Crater is derived from a combination of data from three Mars orbiters. The view is looking straight down on the crater from orbit. Gale Crater is 96 miles (154 kilometers) in diameter. Mount Sharp rises about 3.4 miles (5.5 kilometers) above the floor of Gale Crater. During a prime mission lasting nearly two years after landing, Curiosity will use 10 instruments to investigate whether this area of Mars has ever offered conditions favorable for life, including the chemical ingredients for life. The image combines elevation data from the High Resolution Stereo Camera on the European Space Agency's Mars Express orbiter, image data from the Context Camera on NASA's Mars Reconnaissance Orbiter, and color information from Viking Orbiter imagery.